I saw this guy awhile ago and couldn't find it again until recently. 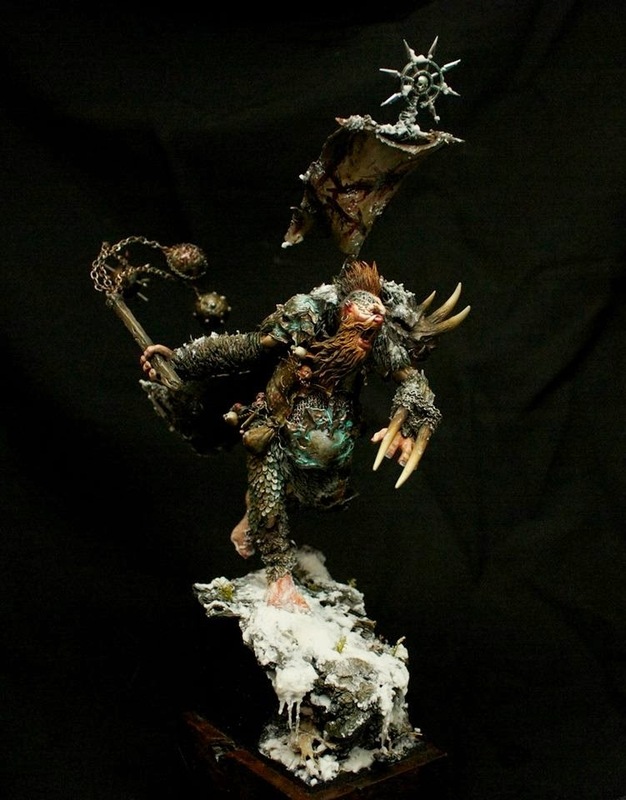 Now this is what I call a Chaos giant. I love how it's not all mutated and over the top, but instead looks like what I imagine a giant living with the Norse would look like. The hair and fur are really great on him with tons of movement. Hair on a giant is not something you see often, but is a nice change from the standard bald head. I mean, if you're living in the frozen north you probably wouldn't want to shave your head. 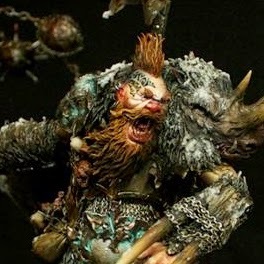 This guy almost looks like he could just as easily exist in Game of Thrones as he does in Warhammer. Beyond the top notch sculpting the paint job is fantastic as well. All of the colors are muted and realistic looking, but still varied enough to not become muddy looking. I particularly like how the face was painted. The paleness of the skin coupled with how red his nose, mouth, and ears are really convey a sense of this guy living in a cold environment. Everything about this model is just great. I found him again on a website called Putty and Paint. It's an invitation only miniature website, somewhat similar to Cool Mini or Not. It's great for browsing through some of the top artists' work out there. Be sure to check out more views of it on Putty and Paint and show the artist some love if you like it.